Pinkalicious the Musical: Pinktastic Fun for Fans of PINK! Pinkalicious has been a long time favorite of our 9-year-old daughter’s so we were pretty excited to attend the opening night performance of Pinkalicious the Musical at Dallas Children’s Theater. 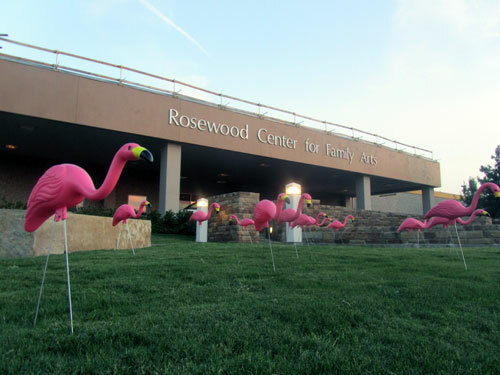 As we were driving up to the Rosewood Center for Family Arts, we noticed a bunch of flamingos lined up outside and along the drive. It didn’t take long for my kids to figure out that the PINK flamingos were there to represent Pinkalicious! 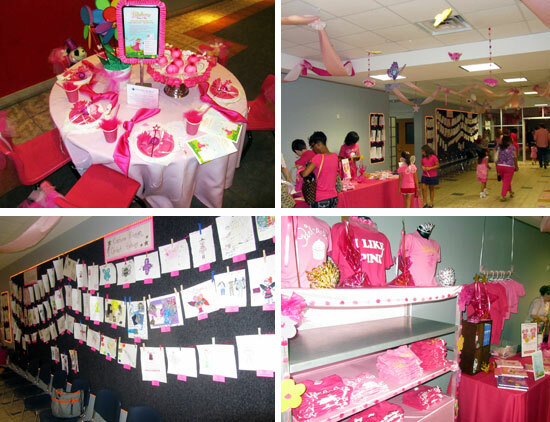 The Dallas Children’s Theater lobby was decked out festively in pink, including a fun table set up with pink place settings and faux pink cupcakes. There was also a concession area where attendees could buy items like Pinkalicious themed t-shirts, books (including a neat sticker book! ), stationery, tiaras, etc. Our daughter chose a fun “Pink-a-Boo” t-shirt and we also got a book. If you weren’t able to come to opening night, don’t worry as all of these extras will be available throughout the show’s performance run. Lining one wall of the lobby were all the submissions sent in from kids for DCT’s first ever costume design contest, including our daughter’s masterpiece (read: proud mama!). It was neat to see all the creative ideas that came in. Even more fun to see the winning designs come to life later in the show. 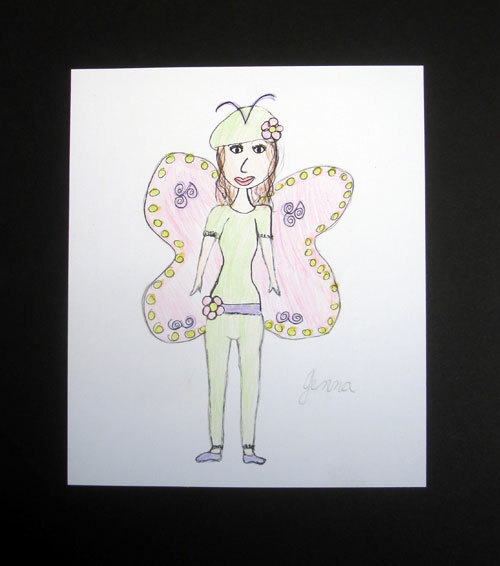 Here’s a photo of the winning costume designs by artist Lily Forbes and an “after” of the costumes on stage – cute huh? The show itself was so much fun! If you’re not familiar with the storyline, Pinkalicious is a little girl who is infatuated with the color pink and she especially loves pink cupcakes. One night, she eats one too many cupcakes and turns pink overnight! When she wakes up the next morning, Pinkalicious is thrilled — her parents, not so much. Mom and Dad take Pinkalicious to the doctor and she is diagnosed with pinkititis – only the second case in history. Spoiler alert (kind of) – the first person to contract pinkititis is someone Pinkalicious knows…. I was pretty impressed with Pinkalicious’ transformation to the color pink because it looked so realistic. It was hard to believe that the pink look was achieved with just special lighting effects. I thought for sure that Emily Lockhart, who plays Pinkalicious, had somehow put pink make up on back stage, but the whole transformation scene was just a few minutes long so there wouldn’t have been enough time to do much more than change costumes — pretty cool! The musical scores were nicely done and Brandon Wilhelm, who plays Pinkalicious’ brother Peter, really shined in his solo about the “pink blues.” I liked that the scenes transitioned smoothly and that the length of the musical numbers were just right – not too long and not too short. 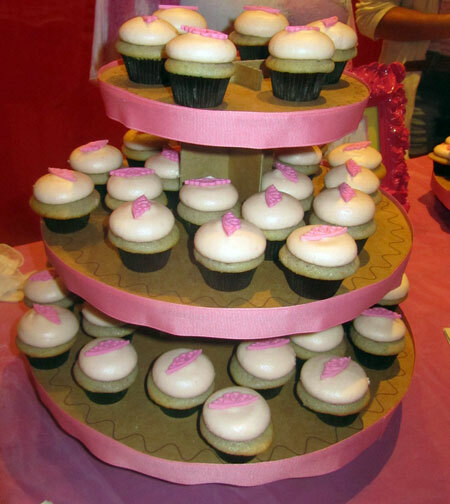 Before we knew it, it was time for intermission and we were looking forward to cupcakes from Sprinkles. Here, we were a little disappointed because these were mini cupcakes and just didn’t scream “Sprinkles!” at us. The last time we had Sprinkles at Dallas Children’s Theater, the cupcakes were the real thing and there was no doubt from the variety and the uniqueness that they were Sprinkles cupcakes. The second half of the show lasted about 20 minutes, followed by a meet & greet and autograph session with the show’s cast, one of the really special parts of the whole Dallas Children’s Theater experience! Even our 9-year-old son, who was hesitant about coming to see what he considered a “girl’s show” enjoyed meeting and taking photos with Pinkalicious herself. I should also add that although our son grumbled a little earlier in the evening, he was pretty engrossed in watching the storyline unfold and his attention didn’t waiver. Pinkalicious the Musical is the first show of the 2012-2013 season at Dallas Children’s Theater so this is a great time to get season tickets for your family. Season tickets save you money and are a significant part of DCT’s financial funding. Something new for season ticket holders this year is the Passport to Imagination, a fun booklet with activities, room for autographs and a special area for kids to collect passport stamps from each show — just like a real passport! The booklet is free for season subscribers and is also available for purchase to individual ticket holders for $10. 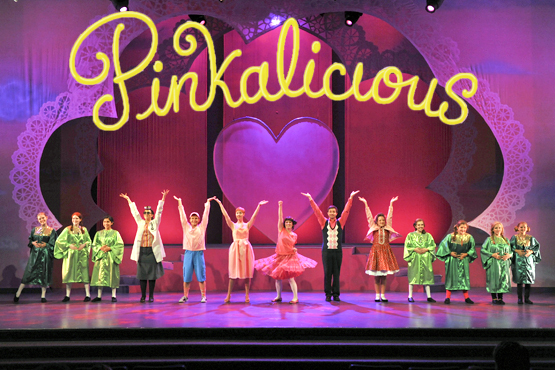 If you have a Pinkalicious fan in your family, you should definitely go see the show. Opening weekend was sold out so get your tickets as soon as you can. The show is playing through October 21, 2012. For more information, visit the DCT website at www.dct.org. You can also connect with DCT on Facebook or follow their tweets on Twitter. Mina Frannea is a freelance writer, web editor and social media consultant. A Mom to nine-year-old twins, Mina enjoys writing about family friendly events and activities in DFW, favorite recipes and crafts that keep her children busy and happy. Visit her blog at www.themomsjournal.com. Disclosure: Dallas Children’s Theater invited my family to this performance of Pinkalicious the Musical. The above represents my personal opinion of this production. Fantastic review Mina. Mia is going with her grandmother (and cousin)on Sunday. She is super excited!